Problems in Ukraine’s defence housing are costly to Ukraine’s societal and political security. Unless changes are made to the current conditions, it could take over 600 years for the Ministry of Defence to resolve its defence housing problem and provide housing for personnel waiting for homes. Moreover, damages incurred to Ukraine’s budget, as a result of inefficiencies and subjective decision-making power, run into many billions of hryvnas. 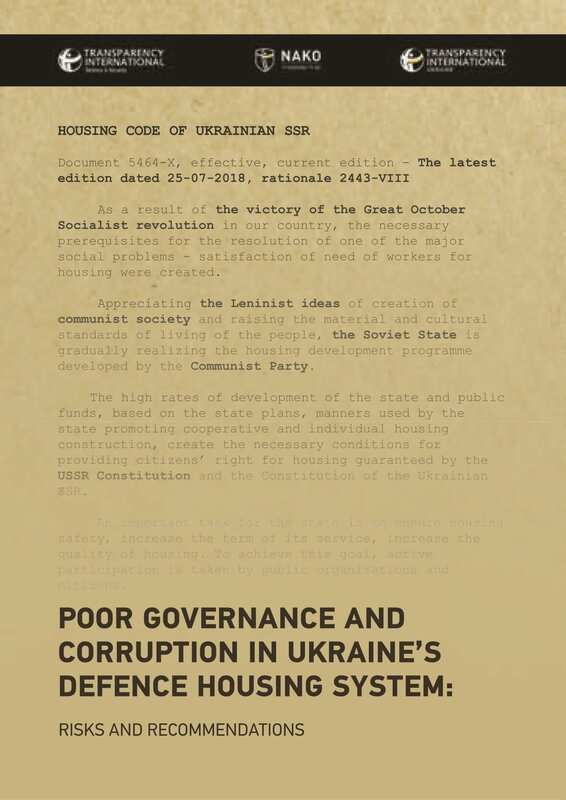 From its outdated Soviet promise of providing permanent housing to its servicemen/women to its current planning system,Ukraine’s approach to defence housing violates international best practices, and enriches corrupt criminal networks. The Independent Defence Anti-Corruption Committee (NAKO), a joint initiative of Transparency International Defence & Security Program and Transparency International Ukraine, has analysed the issues of defence housing in Ukraine. It recommends the Ukrainian government develop a new defence housing strategy and adopt the necessary legislation to reform this sector. This legislation is missing from the Strategic Defence Bulletin, but is provided for by the National Security Strategy and the Concept for the Development of Ukraine’s Security and Defence Sector. The strategy must account for the real needs of the military, include all relevant infrastructure to the defence housing database, and reflect the current Ukrainian real estate market.